There are two types of Hidan in Naruto Online game. We will take a look at the strongest form of Hidan which is Hidan [Death Possesion Blood]. He is one of the strongest ninja in Naruto Online game. 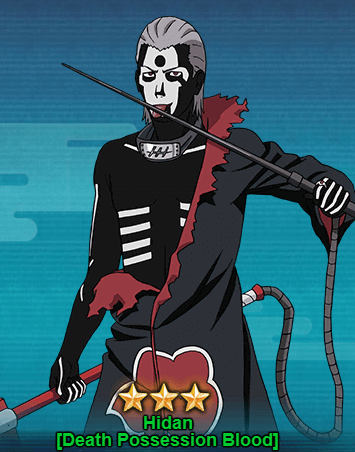 Hidan is a missing S Rank shinobi from the Village Hidden by Hot Water. He was teamed up with Kakuzu when he joined Akatsuki though both fought in the first place. The special ability of Hidan is his immortality with Jasin Ritual and Curse. If he is able to get his opponent’s blood, he will create a link with Jashin symbol which inflict every damage done to himself to the opponent. Let’s take a look at Hidan [Death Possesion Blood]. Taijutsu Sickle Dance[Prompt]: Causes damage up to 3 of the opponent’s units and 8 COMBO, will also cause those units to suffer from Tag. Taijutsu, Ninjutsu Punishment by Branding: Causes damage up to 6 ninjas suffering from Tag, including himself. Will give priority to this units with the highest Life and Attack attribute. Taijutsu Flying Sickle: Chases and Attacks High Floated unit, causes Repulse, 10 COMBO and Tag. Ninjutsu Cruelty : The lower the Life you have, the higher will the attack become. Ninjutsu Eternal Life: If this unit is defeated, it will resurrect 2 rounds later with 40% of its original Life points.